With Phase I complete, the University of Arizona’s 65-acre Bio Park is “development-ready.” That milestone has prompted private developers and investors to move forward on their business plans at the massive science and tech venture. “We’re in a challenging economic market. To attract commercial development, we had to make the site development-ready,” said Bruce Wright, Associate Vice President for University Research Parks. Phase I focused on the construction of roads, water and sewer, electric and telecom utilities, and supporting services. The costs were funded by $4.7 million in federal grants. 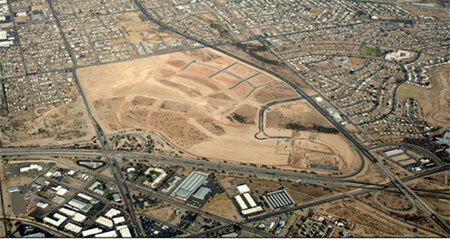 In Phase II, the storm drainage facilities and a road on the western perimeter will be completed. “By December, we will have the site fully developed and ready to go vertical,” said Wright. 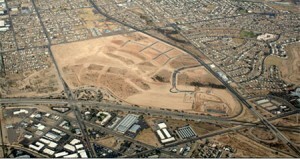 The Bio Park is part of The Bridges, a 350-acre master planned community at 36th Street and Kino Parkway. The mixed-use project includes research, retail, residential and recreational components. “We are in active discussions with a major student housing developer and have been approached by three different hotel developers, including Hyatt and Hilton, to do the hotel conference center,” Wright said.